June 1st 2011 was the date we “officially” heard the news about Kim Sun-Ah upcoming drama Scent of A Woman. But 6 years ago, Kim Sun-Ah made history in the Korean entertainment scene through My Name Is Kim Sam Soon. It was June 1st 2005 when My Name Is Kim Sam Soon first aired with a 18.3% rating (nationwide – TNS). Eight weeks later, it broke the 50% rating (50.5% – nationwide – TNS) and had already captured (and still is capturing) everyone’s heart. Time flies. Who would’ve thought that it was 6 years ago! And I wonder how Sam-Soon is now? Is she still doing fine? Is she happy? 산순이 언니 잘 지냈어요? 보고 싶어요… 그 동안 고마워요. 오늘도 화이팅! I’ve mention this before HERE. But now, IT’S OFFICIAL!!! King Kong Entertainment and Suna Unnie herself, has officially announced it in Kim Sun Ah’s Official Facebook page last June 1st. There were also a couple of news articles that were published on the same date. Alright, this has happened before in I Am Legend – when it was confirmed as her drama, but she quit almost at the last minute (which is a very very VERY wise decision! 🙂 ). So I really don’t want to keep my hopes too high, in case we get another disappointment. However, it’s a bit different this time because both her and her management company have made an announcement about this drama. Suna Unnie even played with the title, changing 여인의 향기 (Woman’s Scent) to 선아의 향기 (Suna’s Scent). ME! ME! ME! MEEEE!!!!!! 2011.07.16!!!! I can hardly wait! Finally I made Kim Sun-Ah say (or write) ‘thank you’ in Filipino!!! Suna Unnie didn’t know… but this is one of my motivations to pursue linguistics. I started finding languages interesting as I interact with her fans from different parts of the world. 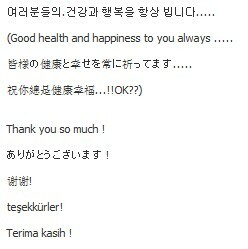 I guess I wouldn’t have left a comment if Suna Unnie didn’t include Turkish and Indonesian on her message. It’s common for her to write greetings and salutations in 4 languages (Korean, Japanese, Chinese and English) but it’s the first time she uses more than 4 languages. 🙂 But I left this comment without any expectations. As I’ve said, it was just a joke. I’m not even sure if Suna Unnie will be able to read it. I wasn’t expecting such a reply from her. And yes, finally she’s talking to me in Korean!!! When I woke up, she surprised me once again! 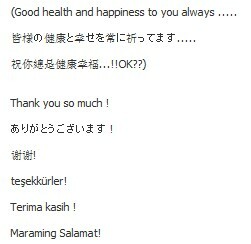 She edited her original message and added ‘Maraming Salamat’. This is the first time I tried translating a news article. I was just really curious about this article, that’s why. And some Kim Sun-Ah fans are curious about it. It’s not very long too, so I tried. I used the dictionary a lot though. However I’m happy that I encountered a bunch of words on this article on the TOPIK paper that I’m studying now. There was one sentence that I really couldn’t translate, so my dear Suh Zin (바보 킹콩) helped me. 배우 김선아가 페이스북(http://www.facebook.com/OfficialKimSunA)을 통해 팬들과 더욱 가깝게 소통한다. 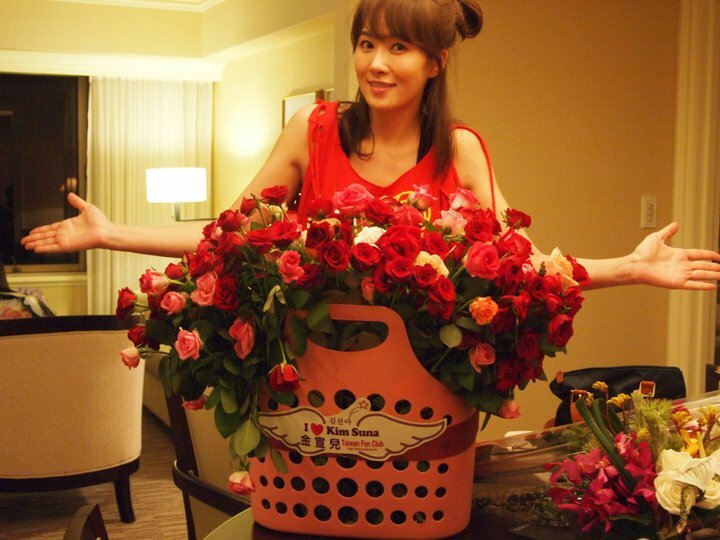 Actress Kim Sun Ah, communicates more closely to her fans through her facebook (http://www.facebook.com/OfficialKimSunA). 김선아는 지난 5월 20일 자신의 페이스북을 오픈했다. 페이스북 속 김선아는 작품 활동 사진 및 동영상, 비하인드 스토리 등이 담겼다. 진지하게 작품에 임하는 모습과 생생한 촬영장 뒷이야기는 물론 웃음이 묻어나는 재미있는 사진까지 선보이고 있다. Kim Sun Ah’s official facebook opened last May 20th. Her facebook is filled with photos of her work activities as well as videos and behind the scenes. The photos also show us the reality action, funny appearence and interesting backstage stories. 소속사는 “김선아가 한류스타로 각광을 받고 있는 만큼, 페이스북을 오픈 하자마자 국내 팬들은 물론 해외 팬들의 뜨거운 성원을 받고 있다.”며 “페이스북을 통해 배우 김선아에 대한 빠른 소식과 다양한 정보를 전해드리겠다. 또한 김선아 본인의 진솔한 이야기로 팬들과 더욱 가깝게 소통할 수 있을 것으로 기대된다.”고 전했다. 김선아는 “페이스북을 오픈한 지 얼마 안 됐는데, 많은 분 들이 찾아주시고, 응원해주시고, 너무 좋은 말씀 많이 해주셔서 정말 감사한 마음이다. 여러분들의 따뜻한 한마디는 그 어떤 영양제보다도 효력이 큰 같다.”며 “새로운 시작의 설레임은 항상 참 좋은 것 같다. 페이스북을 시작으로 많은 분들과 가깝게 이야기 나눌 수 있었으면 한다.”고 전했다. Also in a phone interview, Kim Sun Ah said, “My heart is truly grateful because it hasn’t been long since (my) Facebook opened, but a lot of people have already came (found it), gave support/cheer and left very nice messages (good words). It seems like everyone’s warm words have greater effect (effectiveness) than any other tonic. By starting facebook, I can share close conversation with many people”. 한편, 김선아는 영화 `투혼`(가제, 감독 김상진)의 촬영을 마치고 올 가을 관객들을 찾아갈 계획이며, SBS 주말특별기획 ‘여인의 향기’(가제)를 통해 안방극장에 돌아올 예정이다. Meanwhile, Kim Sun Ah’s movie “Fighting Spirit” (working title, Directed by Kim Sang-Jin) has completed filming and is planned to be released this coming fall, and she’s expected to return to TV through SBS Weekend Drama Special “Scent of a Woman” (working title). It was not the first time – but it feels like the first time all the time. So, yesterday was the launch of Kim Sun-Ah’s Official Facebook page. We’ve been crazily waiting for it since it was announced the night before the opening. When it was opened at exactly 12:00nn (Seoul Time), I was the third person to like it (I think). And I was the first one to make a wall post. All throughout the day, fans came by and left wall posts one after the other. I keep refreshing the page mainly because I want to read the wall posts by her fans. A big percentage of my Facebook friends are her fans (as of this time 85 out of 1,230 likes were my friends). I was happy seeing familiar faces on Kim Sun-Ah’s wall and at the same time I was happy reading messages from people I don’t know saying how much they like Kim Sun-Ah, how happy they are that she’s on Facebook, and asking her questions. It makes my heart warm and it makes me feel proud. Plus I also enjoyed that about half of the wall posts are in Korean, thus I get to test my Korean and see whether I can understand them or not. 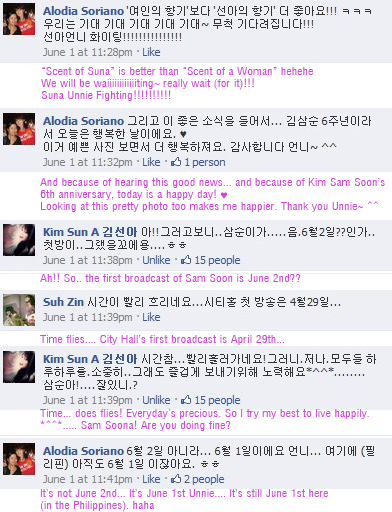 Around 7:00pm (Seoul Time) Kim Sun-Ah started leaving comments on posts on her wall. She started replying from the most recent post and moved her way to down. I keep refreshing the page as she leaves replies one after the other. As I stare on my laptop screen, I kept wondering if it’s really her or her management staff. It was the first time she/they were online since the launch. They have prepared the facebook page days ago and were just opened to the public yesterday noon. Could it really be her? Maybe it’s just her staff. The replies were mostly short. Mostly ‘thanks’ and ‘yes’ or ‘no’s. But they were cute like 아니네용, 안될껀없는뎅 and some spellings were modified like 우윳빛깔 (for 우유 빛깔) – exactly how our Suna Unnie used to do most of the time (I actually learned those from her). Still, I cannot be sure. Any Korean can do that anyway. But when it reached Ayu’s post, my heart skipped a bit. She said Ayu’s name on her comment – and talked to her in Korean, then in Japanese. Suna Unnie knows Ayu. Ayu is a Japanese who speaks good Korean and who frequents Kim Sun-Ah’s events. Whenever there’s an event (a fanmeeting, a birthday party, an M.T., etc) Ayu is around – in Korea, in Japan, even in Taiwan. But she didn’t type in Japanese. She wrote them in 한글. She does that sometimes, but sometimes she also types in Japanase. But it could also very well be one of her staff. They must have known Ayu too. Especially because a few years ago, she helped MBC in translating Japanese-Korean-Japanese dialogue in Kim Sun-Ah’s drama When It’s At Night (밤이면 밤마다). Right there and then, I died! That must be her! No! That’s DEFINITELY her! There’s no way for her management team to know I’m Dia. I would be in doubt if I’m using Dia Soriano as my Facebook name. But I’m not. In fact, I was surprised as to how Suna Unnie recognized that it was me – Dia. It’s the last 3 letters of my name but I’ve never used Alodia in her cafe and I never signed as Alodia on any letters/gifts I gave her. Unless she even read the shipper’s address on packages I sent her (and why would she do that?). Or maybe she remembered it when she sent me a package before. Nah! I’m sure it’s her manager who wrote my address on that parcel. Or maybe she remembered it when she signed a photo for me last year and she wrote my complete name – surname and all (because we were told to send her our full names!). But other than that, to her I’m always Dia. Hmm… she could’ve recognized our photo together since it was my profile picture in Facebook. After all it was on that day when I heard her call my name “Dia”. Or she must’ve read my first post on her wall when I wrote 디야 – 필리핀. Or my comments on some photos she uploaded that I also signed as 디야 – 필리핀. I really don’t know… And it really surprised me – a wonderful surprise at that! My friend has a point. 압니다. 알았지만 놀랐다. I know, but it still surprises me. I just can’t believe it that she recognized me again – and can still remember me. Her “calling” my name again feels like heaven. Then yesterday, once more, she said my name. She didn’t reply to everyone though. I was actually surprised that she exerted effort to reply to a handful of fans. She started from the most recent and replied to the next 22 or 23 posts (and liked one post). Then went back and replied to 2 or 3 new ones (a total of 25 replies). She said on the last post that that would be all for the day. And she never re-reply anymore. A couple of hours later she posted a new photo and a new message but she never replied to posts anymore. Facebook has never been this fun. Even if Suna Unnie is not online, it’s still fun. There’s a certain atmosphere on her page that gave warmth to my heart. Reading fans’ comments, meeting more and more new friends – It’s just wonderful and heartwarming. We heard about this 빅뉴스 (big news) a few minutes before midnight last night. And even though it was said that it won’t open until noontime today, I/we simply can’t sleep due to excitement. I surfed the net, listened to some podcast, and even managed to watched a couple of episodes of a drama I’m watching (which is quite surprising because every night I am usually knocked out just after one episode) before I can finally doze off – at past 4:00 in the morning. I actually wanted to sleep early to make sure that I’ll be awake when it opens this morning (and because I have work). I woke up early nonetheless. And was not feeling sleepy at all. It’s official! KIM SUN AH’S OFFICIAL FACEBOOK PAGE IS NOW OPEN!!! It’s not like this is the first time we/I’ll get to interact with her online. She (and her management team sometimes) is always visible in her fancafe anyway (well, not really always… call it regular instead). But somehow being in Facebook makes a lot of difference! First, she can connect with more of her foreigner fans since not all are (and can be) members of her fancafe. I’m glad that more fans will get to see her photo uploads and messages. 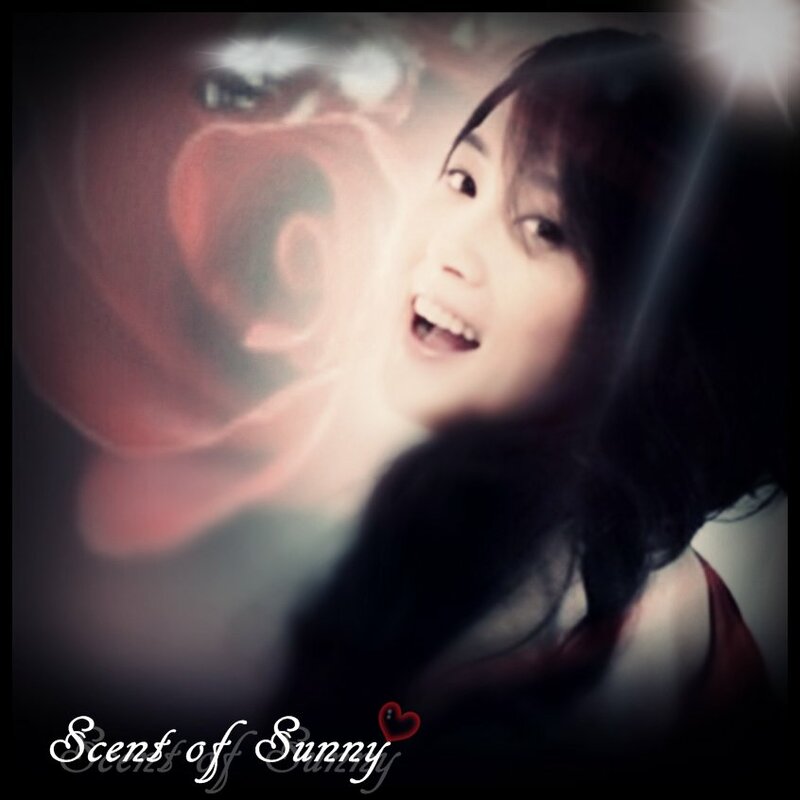 They can also easily disseminate information regarding updates about, and upcoming events of, Suna Unnie. And it will be easily accessible. I’m also happy because I’m always on Facebook. So this time I hope I won’t miss anything. There are numerous times when I missed a lot in the fancafe simply because I feel lazy to log-in – or I didn’t log-in at the right time. In facebook, I’m always online. It’s also a good way for her fans to interact more. I’m also glad that Korean member of her fancafe are starting to create their facebook accounts today. This way I can keep in touch with them more regularly since it’s easier to leave messages and updates in facebook than in the cafe. It’s also another chance for me to make myself read in Korean and Japanese. This photo is from her graduation in Kyung Hee University. The tall pretty girl beside her is my first Korean friend Hyun Joo. I asked Hyun Joo to give my congratulatory gift to Suna Unnie that day. This event is very special to me for two reasons. 1.) this is the reason why I’m back to school now and 2.) this is when I found out that Suna Unnie knows me. ♥ 2009.02.19 – I will never forget that date. This photo is taken in her suite in Sherwood Hotel, Taipei. 2010.06.13. I think right after we had our photo together. I’m glad to know that she received the ‘명폼백’ that the Taiwanese fans prepared. Here’s me with the 명품백 before the fanmeeting started. The 명품백 is actually inspired from a romantic scene from her drama City Hall. These were taken from the fanmeeting in Taiwan June 12, 2010. 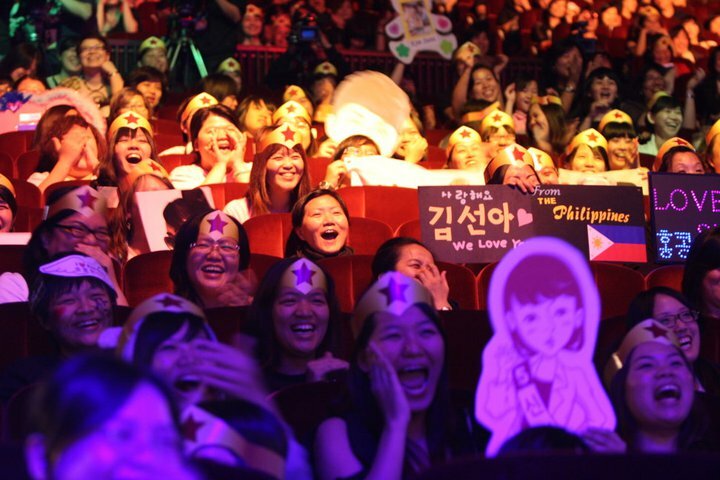 I was the one holding the little banner with ‘사랑해요 김선아 We Love You from the Philippines’. I was so surprised when I saw these photos. I didn’t know that they took a photo of us. I’m glad they kept these photos. And I’m so touched they chose to upload these photos. Today is simply a good day! Merry Christmas everyone! ㅋㅋㅋ How can a person makes me so crazy like this? NOTE: Kim Sun Ah’s official Facebook Page is maintained by her agency. Information, event details, videos and photos were mostly provided by the agency. 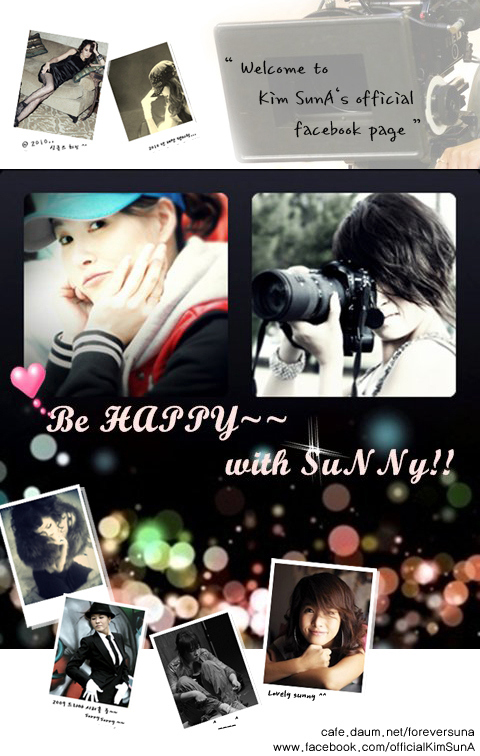 However postings marked “sunny” were written and uploaded by Kim Sun Ah personally. There is also an album named “^^I’m Sunny^^” where she will be posting messages and photos.